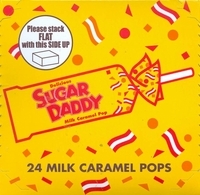 Sugar Daddy Pops are an old time sucker, a delicious milk caramel lollipop. The approximate size of these suckers are 1 �� wide x 3 �� long, enough caramel taffy to keep you busy all day long. These pops are definitely a nostalgic candy; they are the closest you are going to get to the old time favorite Black Cow Sucker. Sugar Daddy Candy History: Sugar Daddies were initially developed in 1925 by James O Welch its original name was the �Papa� this sucker was designed as a rich milk caramel sucker on a stick for easy eating. In 1932 the name was changed to Sugar Daddy to suggest a wealth of sweetness. Welch's Candy was purchased by Warner-Lambert. Sugar Daddies disappeared for a time but the brand was purchased in 1993 by Tootsie Roll Industries, Inc. It since has been a favorite old time candy of all ages and is not just a favorite candy from the 50's. Each box contains 24 Large Sugar Daddy Suckers per box.